This is the free, advertising-supported issue of this newsletter. If you are a volunteer subscriber and received this instead of the ad-free member edition, please let us know at editor@rvtravel.com . A couple of weeks ago, Editor Chuck Woodbury passed along some suggestions on how to pick a good RV site. He asked readers if they had any to add to his list of 15 tips – and we received “umptee-ump” suggestions to add, including the following. Read more of these great reader tips. We still have a drone to give away, but we needed to postpone our contest for another week. We are thrilled to report that Mike Sokol will kick off a national seminar series about RV electricity on June 8 just outside Hagerstown, Maryland, sponsored by RVtravel.com. He will teach two classes about RV electricity — a basic class in the morning followed by an advanced class in the afternoon. Read more about the seminars and let us know if you are interested in attending in person or via a live stream. RVtravel.com members receive a special discounted rate. Another RVer with a horror story. To our RSS feed subscribers: Just a quick note to let you know we have given our RSS feed a much-needed overhaul. 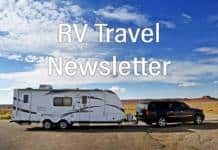 The RSS feed is the email you receive once a day with headlines of the articles we posted to RVtravel.com in the previous 24 hours. Read more. Did you miss last week’s RV Travel? The staff of RVtravel.com works hard to bring you an honest, unbiased, valuable newsletter every Saturday. Readers help make it possible by becoming member-readers with their “voluntary subscriptions.” Many readers set up an ongoing membership, most $5 to $10 a month. But even a one-time contribution of $10 or $20 helps make it possible for us to write about important matters, not just fluff to please advertisers and RV industry big shots. Editor Chuck Woodbury writes: “I was very disheartened last Saturday by many of the remarks about our cover story, which I wrote. I will not even mention the subject for fear of stirring the pot again. More than 400 readers commented, an all-time high for this website. Many of those comments were just plain mean-spirited.” Read more. • Baby Boomers moving beyond the RVing mainstream? Anyone who has traveled with an RV for a few years either has a sewer-related horror story to tell, or has heard one from another RVer. Here’s one we just came across. It’s baaaddd. How do you get your postal mail when you’re on the road full time? Don Humes, the owner of South Dakota’s Americas Mailbox, answers that question. There are basically three ways, one of which Don favors over others (and which most full-timers favor as well). Read more and watch Don’s two-minute video. Any RVer who’s spent any time in an RV park has had his or her share of obnoxious neighbors. They play their boomboxes late at night, watch Rambo movies on the outdoor TVs with the speakers cranked way up, or smoke their cigars right under your bedroom window. But here’s a new one we suspect you’ve never heard before. This one-hour speech by CEO Toby O’Rourke at the recent RV Industry RVX gathering in Salt Lake City is fascinating. There is little doubt after watching this presentation that the times they are a-changin’. The Baby Boom generation, once the bread-and-butter audience for the RV and campground industry, is moving on. Millennials and Gen Xers are the future. Watch the video. Boondocking is not brain surgery. Anyone can camp overnight without hookups. Two or three days takes a little effort — no, not effort but common sense in the use of your resources. Read more. When RVing, how often have you felt your life was in imminent danger from bad guys? Do you listen to podcasts? Do you wear cologne or perfume? Have you ever taken typing lessons? How many rings do you wear? When was the last time you and your partner went out on a date? All this and more (plus a great book suggestion), right here. How would like to have one of these cute little vehicles along with you on your RV trips? The single-passenger vehicle incorporates a 21-speed pedal-drive drivetrain going to its right rear wheel, along with a hub motor in its left rear wheel to supplement the driver’s pedal power. Read more. Purchased a lemon RV? Need a lawyer? Alan Warren, your RV Wingman from The RV Show USA, discusses the realities of filing a lawsuit against an RV manufacturer or sleazy RV dealer, and gives some advice for those who have a sure-fire lemon RV. Read more. The RV Industry Association’s (RVIA) February survey of manufacturers shows that RV shipments ended the month with 36,421 wholesale shipments, a decrease of 15.4% from the 43,038 units shipped last February. Learn more. More than 2,400 RV enthusiasts joined together in Tucson last week for the Escapees RV Club’s 59th Escapade. The event at the Pima County Fairgrounds attracted RVers from across North America and Mexico. The week’s events included approximately 80 educational seminars. Read more. The positive reviews on this make it the best bet for keeping your RV rodent-free. This is the only plant-based rodent repellent registered for inside use by the EPA. It effectively repels rodents up to 100 days with a “woodsy” scent that’s pleasant to humans but offensive to rodents. It’s safe around kids and pets so no safety warning is required. 98% biodegradable. Used effectively by the RV Travel staff. Learn more or order. In this segment from The RV Show USA, Mike Sokol explains how someone can easily be electrocuted while swimming near a dock where a boat’s electrical hookup is miswired. And it’s not just the fact that someone can be “shocked” to death, but the way they die that’s the scariest. Watch the 10-minute video. While it may not be “just the thing” for the typical RVer, there’s a new RV on the market that for the young and the physically flexible may be worth looking into. It’s called Polydrop. Naw, forget pictures of your favorite parrot taking a dive, the Polydrop trailer is a “polygonized” teardrop rig with a couple of twists. Read more. If you want to see how RVing has changed, especially how the marketing of RVs to consumers has changed, and how the audience has responded, watch this episode from “The Ellen Show.” Two New York City millennials see an RV up close and personal. Watch their reactions. Read more and watch the video. If you can restrain your wanderlust for a few weeks, then mark your calendar for Saturday, April 20 for the second Free Entrance Day of the year at America’s National Parks. Read more. Rich “The Wanderman” has updated his very thorough annual checklist: “How to go from winter’s slumber to spring’s reawakening and perform a yearly safety check.” And there are numerous links throughout to fully describe a lot of the steps. Wow – Is this ever handy! Check it out! • RV Electricity – Why did my shore power plug neutral burn up? • Another take on the Campground of the Future. • New RV discount club website debuts. • Ah, camping! Your own outdoor movie theater! • RVer Safety: I carry a gun – Should I have insurance? • Building an RV park from scratch: I don’t know what I’m doing! • RV spring shakedown primer. • What we learned about you last week (March 16-22). Our two Facebook Groups: RV Horror Stories and RV Advice. Listen each Wednesday evening on Facebook or YouTube for the live taping of America’s only syndicated radio program about RVing. This is not pretty – dozens of videos of RVs burning up. But the point is to help viewers understand that RVs burn fast, and they need to practice good fire-prevention habits and practice an escape plan … just in case. Change from week before: Up 8 cents; Change from year before: Down 3 cents. Change from week before: Up 1 cent; Change from year before: Up 7 cents. This large silicon pad can be used in your microwave under hot bowls to pick them up, or on top of a dish as a splatter guard, on your table as a hot plate, a drying rack, or even as a jar opener. When it gets messy just toss it in the sink for a wash, or even put it in the dishwasher. About $10 on Amazon makes it a great deal. Talk about a great multi-tasking gadget for your RV (or home) kitchen. Don’t use Magic Eraser on these! Stone countertops: It removes the protective seal on your stone countertops. Without that protective seal, your stone could be vulnerable to scratches, stains and other forms of permanent damage. Nonstick cookware: Nonstick coating can scratch easily, especially if you clean it with abrasive materials like a Magic Eraser. Once a nonstick pan is scratched, the chemicals from the nonstick coating can get absorbed into your food. Instead, hand wash nonstick pans with a soft sponge and a bit of dish soap. If you have a really stubborn mess on your hands, use a bit of baking soda to help loosen it up. Stainless steel: As durable as it is, cleaning it with a Magic Eraser it will likely end up leaving small scratches on the surface. Instead, use Barkeepers Friend and a soft, wet sponge. Electronic screens: These need to be cleaned super gently to avoid scratching them. That means that Magic Erasers are a big no-no for cleaning screens! The tow car (or truck): Sure, this oughta be a no-brainer, but just to be on the safe side …. Vehicle paint has a protective coating which helps protect the paint and makes your car easier to clean. But a Magic Eraser can rub right through that protective coating down to the paint easily! You can use a Magic Eraser to remove particularly stubborn bugs from the front end of your car, but just make sure to be conscious of how much force you are using. If you boondock, sometimes “coming home” to the rig after dark can be a challenge. Assuming you have good battery capacity, get yourself a 7-pin receptacle, and run a jump wire between the battery connector and the running light connector. Plug this modified receptacle on to your trailer’s 7-pin connector and you’ll have running lights on your rig to guide you home. It’s almost Spring: Time to change your water filter! Camco’s TastePURE Water Filter with Flexible Hose Protector reduces bad taste, odor, chlorine and sediment in drinking water with a 100 micron fiber filter. Its durable in-line, exterior mount filter has a wider body to increase flow. Use it at your campsite to keep sediment out of your RV water tank and to improve the taste and smell of your drinking water for a whole season. Many RVers consider this essential equipment. Learn more or order at a big discount. The ability to come up with pricing for weapon insurance options for liability coverage can be difficult for our readers. It appears the cost is determined by several factors unique to each individual’s needs and desired coverage. Learn more. We have been full-time RVing for about seven years. We have met many wonderful people. However, occasionally we meet a “stalker.” It is usually a single person, perhaps lonely…. “Which team do you pull for?” “That politician is a liar!” “Do you pray?” These and more common sayings/questions can get you swiftly and unceremoniously in hot water when you’re work camping. Read more. We can now run very affordable localized banners on RVtravel.com in your town or in a designated area near you. For example, we can show them to readers within 200, 250, etc., miles of your business — but not elsewhere. So no wasted exposures or money. Advertise your RV show, repair shop or RV park. Contact Emily Woodbury at advertising@rvtravel.com to learn more. We just replaced our Dometic refrigerator with a new one. On our old refrigerator we had an aftermarket 3-way switch put in (AC, DC, propane) – that way we could run our fridge on DC while we drove. Now I am told I can only use propane or electric and the fridge is off during travel. … —Edie T.
Just Ask Mike (J.A.M. ): Should I turn off circuit breakers? This is an experiment to see if you like this Just Ask Mike (J.A.M.) format for a secondary weekly column. Welcome to J.A.M. (Just Ask Mike), a weekly column where Mike Sokol answers your basic electrical questions. If you’re a newbie who’s never plugged in a shore power cord (or ask – what’s a shore power cord? ), or wonder why your daughter’s hair dryer keeps tripping the circuit breaker, this column is for you. Read more about this new (potential) feature and about circuit breakers. RV tire expert Roger Marble has written a number of articles on the advisability of running trailer tires at the inflation molded on the tire sidewall. He has found information on the Goodyear website which backs up that recommendation. Learn more. The most expensive thing humans have ever built, the International Space Station whips around the globe 15.5 times a day or every 92 minutes; it has been continuously occupied for nearly 20 years; it’s about the size of a football field; and you can spot it with your naked eye if you know where and when to look. Learn more. Most RVs aren’t equipped with broom closets. Got a basement storage compartment long or wide enough to stick those long-handled tools? Stick ’em up to the ceiling by attaching spring-loaded broom clips to the lid of the compartment. Here’s the ever-RV-popular Command Strips version. A new statue overlooks the Missouri River in the central part of South Dakota. Called Dignity, it’s a 50-foot tall image of a Native American woman and is made of stainless steel and glass. It is a magnificent work of art. Read Len Wilcox’s essay or hear him read it to you. Rice is always nice. Now that cooked rice comes ready to eat in a packet, RV cooks have another shameless shortcut for camp cooking. Serve these crusty cakes as a side dish with meat from the grill, or as a satisfying and filling vegetarian main dish. Get the recipe. Whether your phone is buried in the couch cushions or you left it back at the last campground, there are times you need help to find it. On both Android and iOS devices there is a website to find a lost phone. Learn more. If you travel with a firearm, you need this to avoid breaking state laws. This details the firearm laws of all 50 states, Canada and Mexico, and how to prepare, carry and transport your weapons. What’s legal in one state may be a felony in another! Essential for RVers who cross state lines. Learn more or order. • RV Tips: Wow! 140,000 members! Lots of great information. FREE! Overnight parking is allowed in large gravel lot just south of Chevron station and across SR 95 from Pilot Travel Center. Unlit but fairly level. Appears safe, with possible highway noise. Click here for more details. FREE! Overnight parking is allowed but permission from the manager is required. Park in one of four marked bus parking spaces. Well-lit, and appears safe but is not level. One RVer reports that McDonald’s free WiFi reaches these parking spaces. Click here for more details. Overnight RV Parking, with more than 14,000 locations listed, is the largest and best resource for locating free and inexpensive places to spend a night in an RV. For membership information and a demo of the site, click here. A modest membership fee required, but try the free demo. Watch a video about OvernightRVparking.com. This really isn’t us writing this, it’s the doll… Can you imagine being SO into ventriloquism that you create a collection, an organization, and a magazine dedicated to it? We couldn’t, but William Shakespeare Berger could. Berger began his collection when he purchased his first doll in 1910. After that, his collection grew so rapidly that he had to convert his garage, then erect a second building on his property to house all his talking friends. He created the International Brotherhood of Ventriloquists and started a monthly magazine, “The Oracle,” which kept up with current events in the “Vent” community. Now, you can visit Berger’s collection, which has more than 900 dolls. You can see photos, scripts, memorabilia, playbills, recordings and much more. Visit the museum website here to plan your visit. See the complete list of upcoming RV shows. Alfred Hitchcock’s “Psycho” (1960) was the first American film to show a toilet being flushed on screen. What do you call a game where Germans throw bread at each other? Editor and Publisher: Chuck Woodbury. Managing editor: Diane McGovern. Senior editor: Russ De Maris. Contributing writers: Mike Sokol, Greg Illes, Bob Difley, Richard Miller, Richard Mallery, Gary Bunzer, Roger Marble, Janet Groene, Julianne Crane, Chris Guld, Dave Helgeson, Chris Fellows, Dennis Prichard, Len Wilcox, Sam Suva, Mike Sherman, Machelle James, J.M. Montigel and Andrew Robinson. Advertising director: Emily Woodbury. Marketing director: Jessica Sarvis. IT wrangler: Kim Christiansen. REGIONAL AND LOCAL ADVERTISING: We can now run banners on RVtravel.com in your town or in a designated area near you, for example to readers within 100, 200, etc., miles of your business. Contact Emily Woodbury at advertising(at)RVtravel.com . Next articleRoad Signs # 17 – You are what you eat! I’m a fan of this newsletter, but I confess having to click on “read more” on every single article gets old. As I go thru the newsletter I open a new tab on each article I’m interested in, then when I get to the bottom I start read all the open tabs, closing as I go. Seems to work for me. Chuck, Keep your head held high buddy! You are doing what you do best. I believe that every segment of any society has certain elements of people that live life inside their own little bubble and they don’t care what they say or do because that’s their right. It always sets me on edge that these people are so vicious that they seem to enjoy starting a fight. You can thank Cain and Abel for that. Keep up the good work, it’s all I have left to enjoy in life. Regarding potential explosive conversations, we volunteer host for state parks and the forest service. We keep our opinions to ourselves (mostly). If someone expresses an opinion that we agree with we may casually acknowledge that opinion but if they say something that we consider outrageous or even despicable we keep our mouths shut and either walk away or change the subject. We are always told by our agencies that politics and religion are not to be discussed.